There was a time I wished that my ocular (eye) prosthesis would look more real and would match my “good eye”. I then became more familiar with Medical Art Prosthetics and called Greg Gion, MMS, CCA. I then contacted my surgeons and started moving forward with things. I found HOPE! I lost my left eye to retinoblastoma at a very young age and so I grew up having an orbital implant and wearing an ocular (eye) prosthesis. There was a time I wished that my ocular (eye) prosthesis would look more real and would match my “good eye”. During my younger years the eye prosthesis looked pretty good, but as I grew older it started to recede and didn’t even resemble my natural eye. A few years ago the tissue covering my orbital implant underneath my eye prosthesis started to grow abnormally and would not allow the eye prosthesis to remain intact. After several major surgeries to correct the problem failed I decided that we had exhausted all avenues and I chose to not proceed with any more surgical procedures. I prayed for direction and a solution that would give me back my normal life. Soon wearing a patch became a part of my daily routine as I searched and waited for a solution. Not long after, I learned about how prosthetics are used in the government for altering appearances and in the medical field for facial restoration. I became very intrigued and started researching the types of prostheses, and soon I found out that there was a Medical Artist who does facial prosthetics right here in Dallas!! I then became more familiar with Medical Art Prosthetics and called Greg Gion, MMS, CCA. I then contacted my surgeons and started moving forward with things. I found HOPE! I had always longed for and hoped to have a more normal and natural looking prosthetic eye to better resemble the other. Well, my prayer was answered about a year after I discovered Medical Art Prosthetics. Mr. Gion designed and fabricated a facial (orbital) prosthesis; one that attached magnetically over the area of my eye. My family and friends and many other people that I have met along the way, including my students, have been quite intrigued by how amazingly natural it looks! When I now look in the mirror I count my blessings for having found Medical Art Prosthetics. Greg Gion, MMS, CCA and Allison Vest are artists like no other. They don’t just make prosthetics –they create a work of art! They made my dream come true… and they can do the same for you! 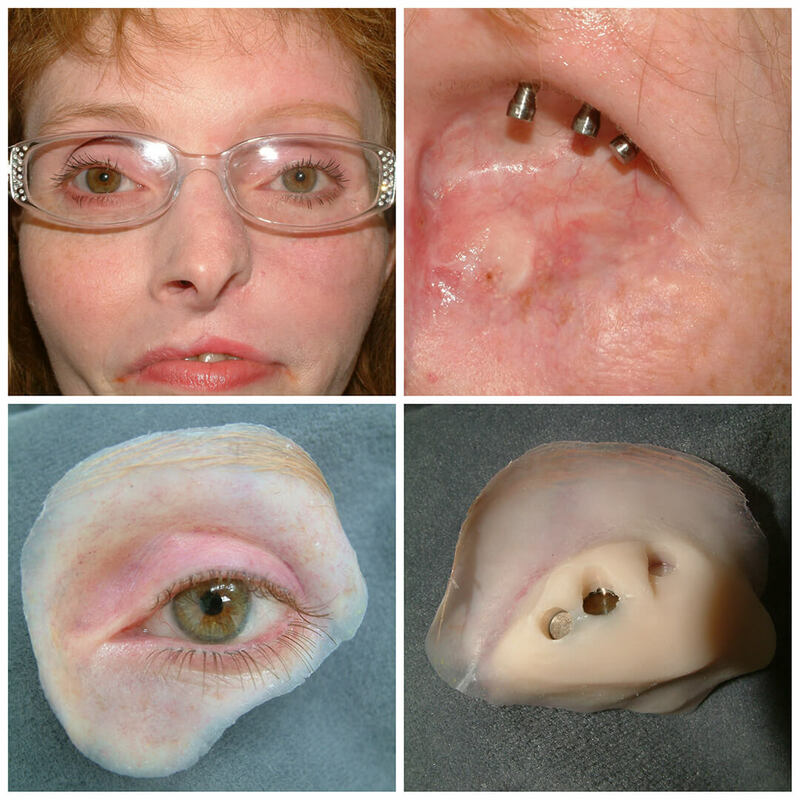 I’ve been wearing an eye prosthesis since 1993 and am now on my second version (implant-retained). This eye is so easy to wear, and it makes me feel and look like a normal person again. My “eye” (orbital prosthesis) looks so real that a new doctor did not even figure out it was a prosthesis! Ms. J.M. underwent orbital exenteration in 1987. Following several years of reconstructive surgery, including revisions to optimize prosthetic fit, Ms. M. underwent prosthetic restoration and received an adhesive-retained orbital prosthesis. After more than a decade of using adhesive, Ms. M. received 3 endosseous implants in her superior and lateral orbital rim so she could have an implant-retained prosthesis. Her new prosthesis now prepared with tiny magnets attaches magnetically to the implant abutments. She now enjoys secure predictable and adhesive free attachment of her prosthesis. People are still amazed that this is a prosthesis and not my real eye. Please send me some of your business cards to give to doctors. Ms. M.R. is a registered nurse who received her first adhesive-retained orbital prosthesis in November 1992. 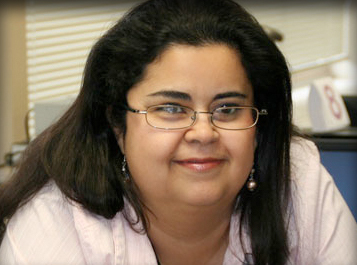 After 11 years, she received a 2-piece anatomically/magnetically-retained orbital prosthesis. She no longer requires medical adhesive. Ms. R.L. received her original orbital prosthesis in the first Dallas office of Greg Gion, MMS, CCA in 1988. For 15 years, Ms. L. proudly wore and managed her prosthesis refusing to retire it for a replacement. Prompted by recall notices and close family, Ms. L. finally elected to return for a newly designed and anatomically updated prosthesis. 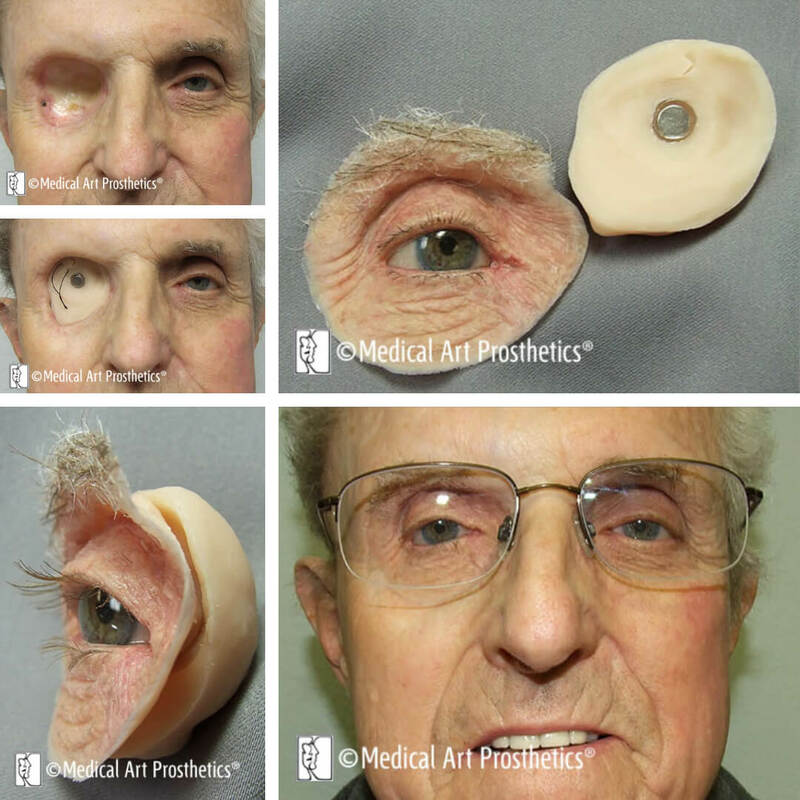 We would love to hear about your eye prothesis from Medical Art Prosthetics.